Brussels is now home to the largest aquaponics farm in the world - combining raising fish with growing vegetables. The 4,000m² farm is located on the roof of the Foodmet, the latest food hall to be built at the Anderlecht Abattoir as part of a new masterplan for the site which is being created with help from the Brussels Region and the European Union. Specialising in the circular economy, architect Steven Beckers is the founder of Building Integrated Greenhouses (BIGH) which has built this farm. He answered The Bulletin's questions about the initiative. 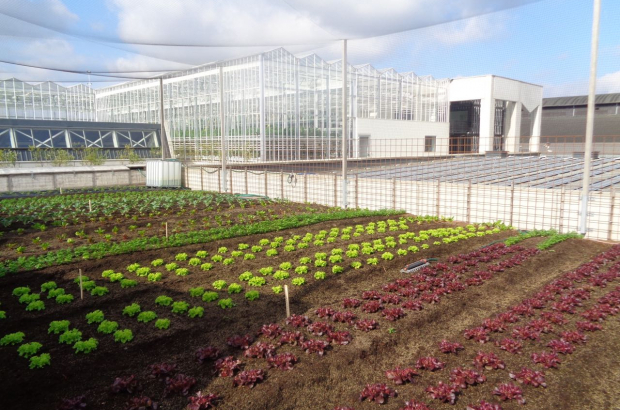 Why is urban agriculture so important? I’m a great believer that the city is the solution - because if it isn’t we really have a problem. Cities already house more than 60% of the world population. You would be amazed how much urban agriculture already exists in many cities, but cities are not resilient in certain areas, if you have a lorry strike or transport strike for more than two days there is no more fresh food. The city has to become productive. The circular economy wants it to be productive in terms of energy, in terms of treating water and reusing water, cleaning the air, producing food, producing electricity or heat. The system is called aquaponics, which has existed for apparently about 1,700 years, used by the Incas and Aztecs and in China, where fish were swimming in the rice fields. Aquaponics is basically using the waste water from the fish, which is filtered by a bio filter filled with billions of micro-organisms that transform ammonia into nitrite and nitrates which are totally absorbable by plants. The closed circuit of the fish system needs to have about 5% of its water renewed every day. The plants are also on the closed circuit system, which allows for saving water and really controlling the quality of the nutrients in the plants. The system has the beauty of being totally transparent - you cannot use any antibiotics or pesticides in the system otherwise it kills the bio filter system, it kills the farm. We have an entirely natural eco-system. In the indoor parts, we raise striped bass and we grow small tomatoes, herbs and micro-greens, which are like sprouts and are a nutritional powerhouse. In the outdoor garden, we produce many types of leafy vegetable, and we also have a small fruit orchard, blackberries, raspberries, strawberries and blueberries. That’s why we have nets around us because here at the abattoir we have a lot of birds. We are next to the canal, so there are seagulls, but also crows who are taking the leftovers from the market and would be happy to eat our production. Our annual production is projected to be 35 tonnes of striped bass, 15 tonnes of very sweet cherry tomatoes, 140,000 herbs pots and 120,000 micro-green units. You identified 150 acres of developable rooftops in the Brussels Region. Do you expect to cover them with additional farms? In fact we identified six million square metres in the region, out of which we decided that 10% could be developed - which is 60 hectares or 150 acres. I hope this is possible - we do have a number of large projects we are looking at in the region. We're looking at the same thing in Antwerp and different cities in France as well.